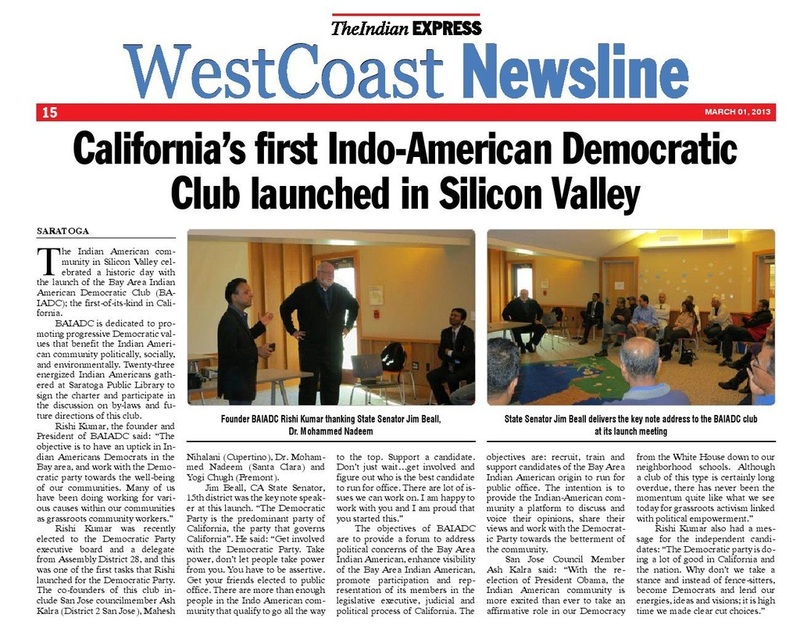 A Democratic Club representing the political views of the Indian-American Democrats in the San Francisco bay area. Intention is to provide the Indian-American community a platform to discuss and voice their opinions, share their views and work with the Democratic party towards the betterment of our local community. Our objective is to bring about an uptick in membership of the Democratic Party, and raise visibility of causes, values and interests that are near and dear to the Democratic party and our club. The function and purpose of BAIADC shall be to participate countywide in the Democratic Party,to cooperate and communicate with other Democratic Associations, Committees and Clubs, to assist Democratic functions in San Francisco Bay Area, and to perform such other activities as the membership may decide. All activities of the BAIADC shall be in conformance with State law and the basic principles ofthe Democratic Party. membership of the organization, advance ethical standards in the political system, and promote equal participation in the political process without regard to race, religion, nationality, physical disability, creed, gender, sexual orientation, age, ethnic origin or economic status. We invite membership from ALL registered Democrats.